Produced by Hopscotch Films and originally screened on Channel 4, the documentary series The Story of Film: An Odyssey sees critically acclaimed director, film critic and curator Mark Cousins embark on an epic journey, in which he chronicles the birth and evolution of cinema as a great and popular art form. Lovingly researched, this 15-hour journey was filmed over six years on five continents and covers eleven decades of movie history illustrated with over a thousand film clips. This voyage takes us to many famous moments in film – the birth of Hollywood and the great movie genres, the evolution of movie stardom, the shock of the French Novelle Vague, the revolution of digital cinema, etc. But it goes much further, to open a window on, amongst many things, Shanghai films of the 30s, the great Indian melodramas of the 50s and the triumph of African filmmakers of the 70s. The journey also touches and delves into social issues at various periods in the 20th Century including the role of women in cinema and the driving force behind the industry. 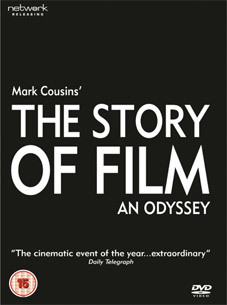 Network Releasing have announces the DVD debut The Story of Film: An Odyssey, which will be available to buy as a 5-disc set on 23rd April 2012 at the RRP of £49.99, in a limited edition steel case. This set includes exclusive interviews with 40 of the greatest filmmakers, including Singin' in the Rain director Stanley Donen; Chinatown writer Robert Towne; The Piano director Jane Campion; Iran's master director Abbas Kiarostami; the most famous actor in the world, Amitabh Bachchan; Danish provocateur Lars Von Trier; French filmmaker Claire Denis; The Graduate writer Buck Henry; and Kyoko Kagawa, who appeared in masterpieces by Akira Kurosawa and Ozu's magnificent Tokyo Story.